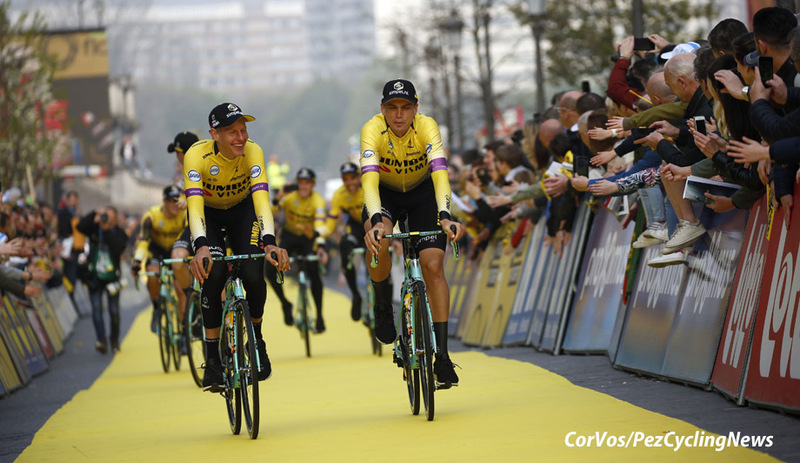 PezCycling News - What's Cool In Road Cycling : Ronde van Vlaanderen’19: Doesn’t Get Bettiol Than This! 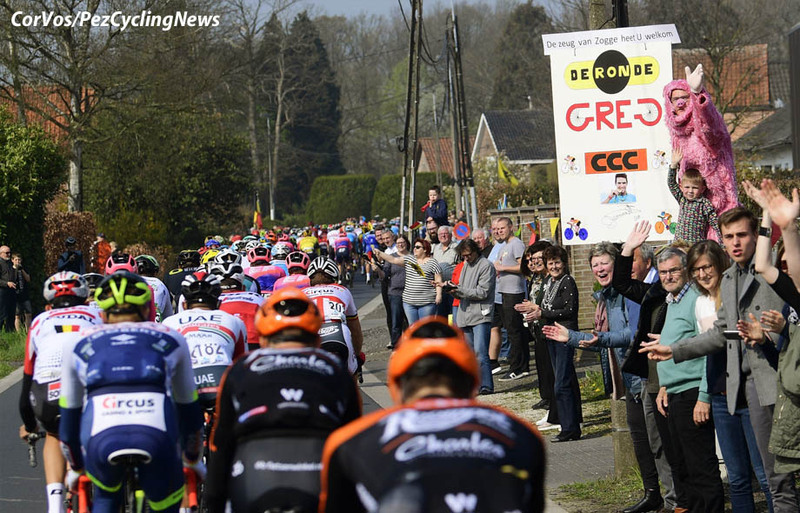 Ronde van Vlaanderen’19: Doesn’t Get Bettiol Than This! 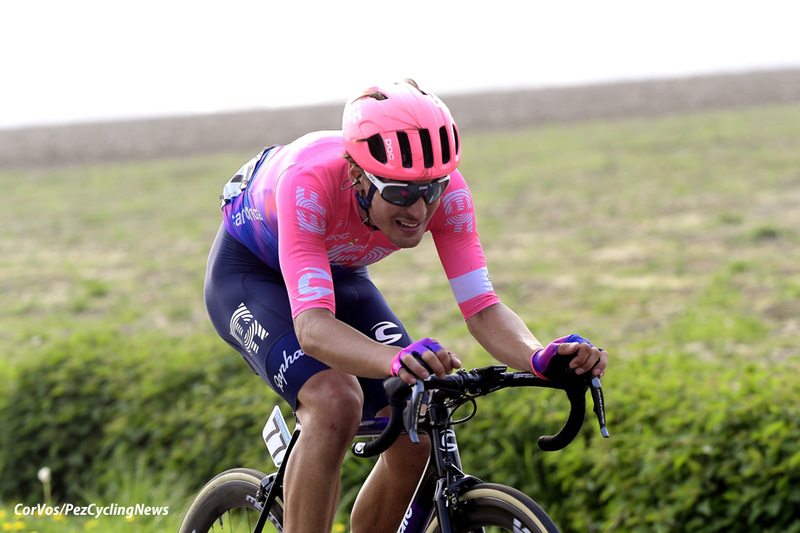 Race Report: Alberto Bettiol was the first to the top of the final ascent of the Oude Kwaremont and he kept his attack going all the way to the line. A high calibre group followed him home but a lack of cohesion ended their efforts. Over six hours of 'full gas' action gave the Italian his first win as a pro - and what a way to start. You can read Ed Hood's thoughts on Bettiol HERE. 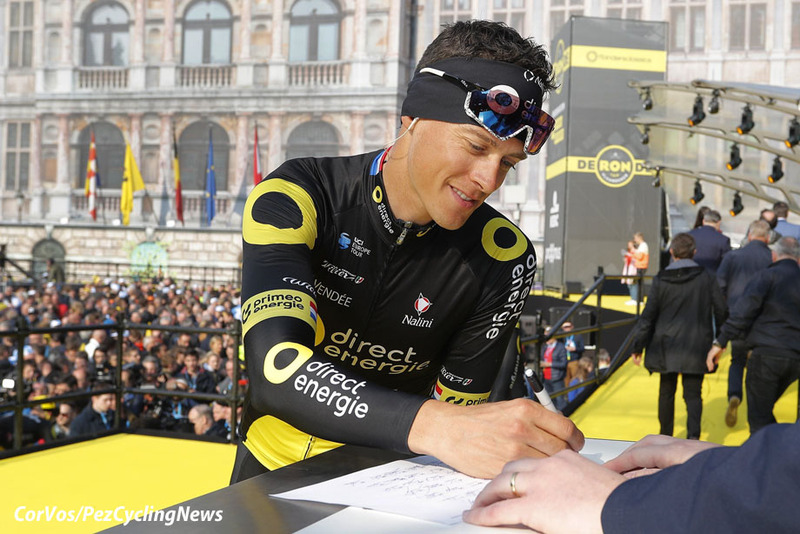 The riders set off for a warm edition of the Tour of Flanders with an anticipated six hours of riding ahead of them. A lead group of four went clear but they were always in danger of coming back into the fold and they did almost as soon as the hills began. 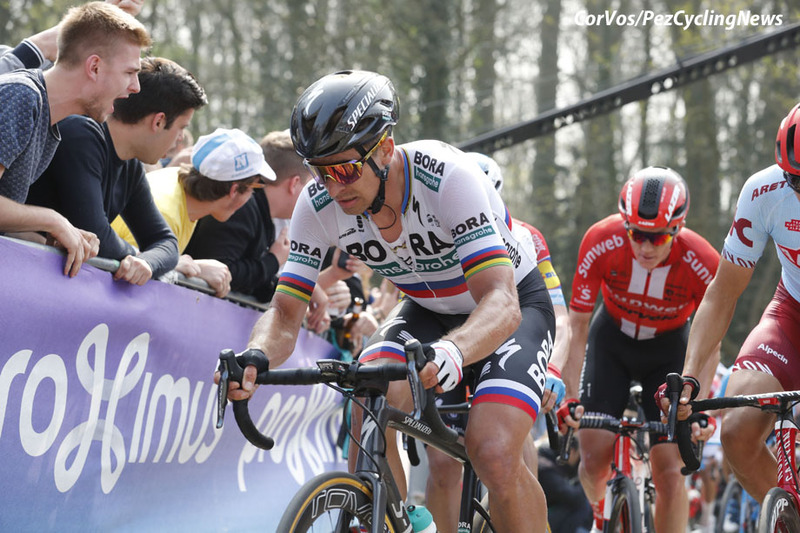 Niki Terpstra fell before the first ascent of the Oude Kwaremont sustaining a serious concussion and leaving the race. As usually happens, the course led to a gradual ending of chances for anyone who couldn't stay near the front and with about 50km to go there was a lead group for 40 riders. Mathieu Van Der Poel was an unfortunate victim of a crash after he punctured and that looked to end his chances but he fought back after an incredible 20km chase and featured heavily in the finale. On the final ascent of the Oude Kwaremont Bettiol drove clear and crossed with a ten-second lead. He kept that all the way to the Paterberg and extended it on the final climb. His lead closed to just ten-seconds on the run in but the chasers refused to work together and his lead increased such that he had plenty of time to celebrate at the finish. 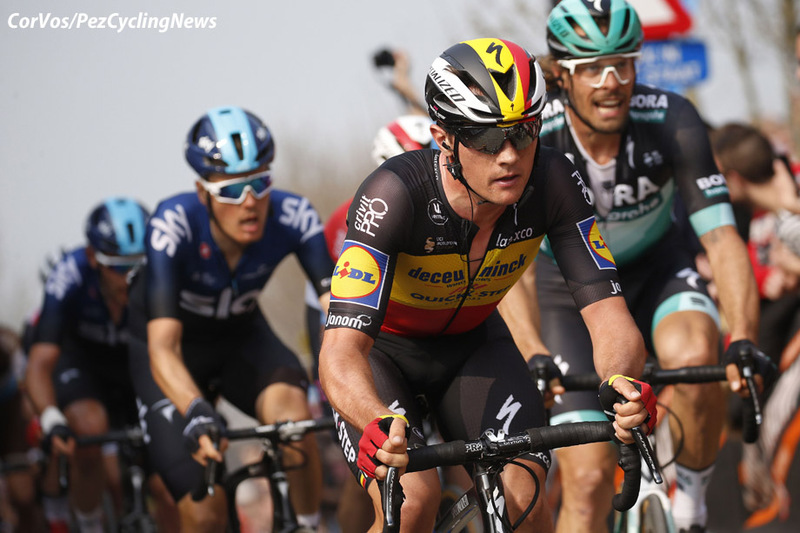 Kasper Asgreen came in second in his debut Tour of Flanders and Alexandr Kristoff won the bunch sprint for third place. The day belonged to Bettiol though who dominated the business end of the race. 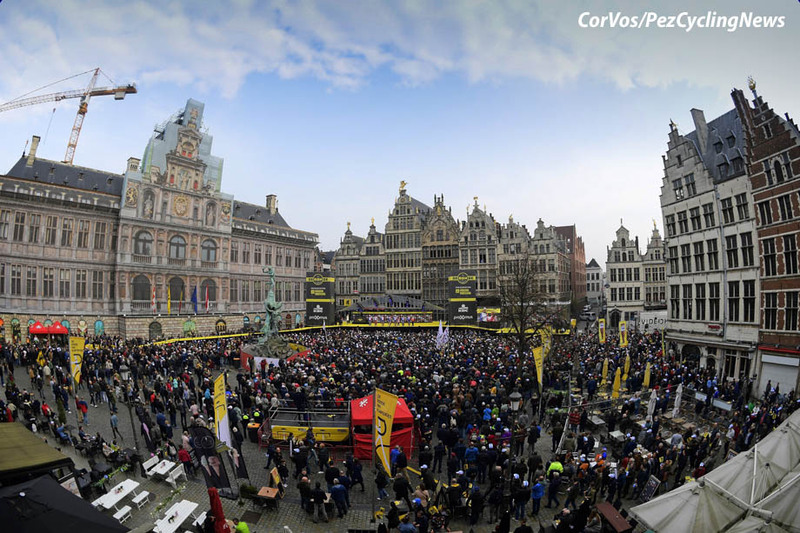 The Tour of Flanders route looks like a headphone lead that fell out of someone's pocket. It's extremely twisty, non-sensical, and hard to follow. The first 110km go from Antwerp to the Oude Kwaremont and are very straight forward, virtually flat and predominantly straight. After that who knows what happens? 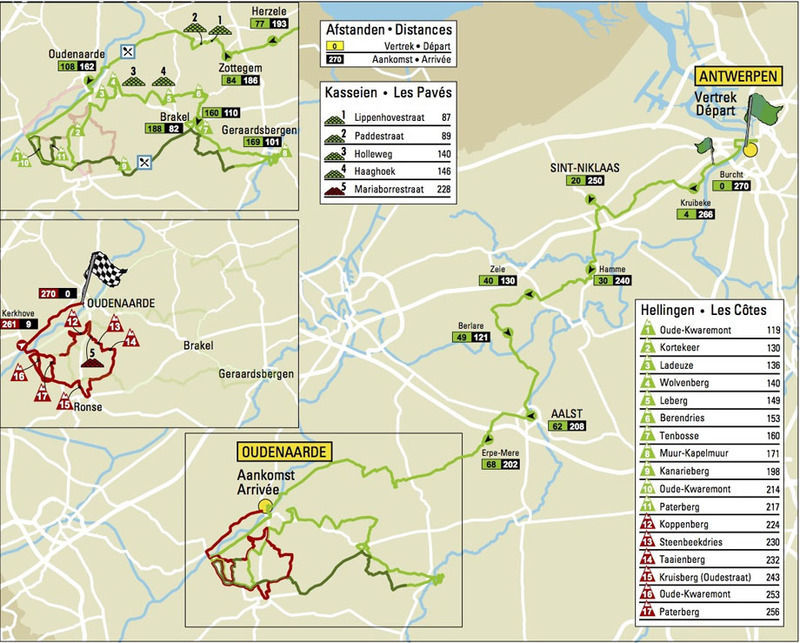 The riders need to cross over the 17 ascents of the course and so they disappear down farm tracks, loop back on themselves, and generally explore all of the Flandrian countryside. The race can essentially be split into three sections, the first 110km where not much of note happens on the course, the second 50km where we crest eight hills before a short period without climbing and then the final 80km where the remaining nine hills get tackled. There is so little flat riding that solo attacks aren't penalised like they normally might be and although you can hide initially the climbs draw the top riders out much sooner than they normally would. 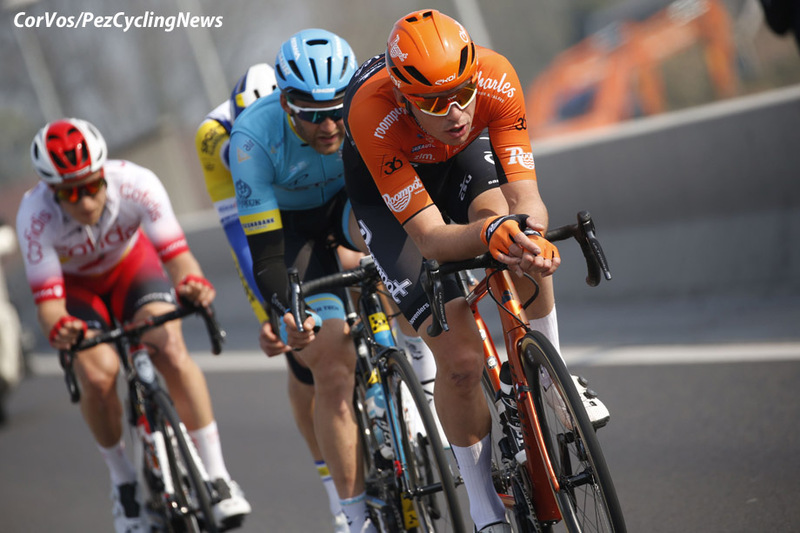 A group of four went clear early on in the racing; Kenneth Van Rooy (Sport Vlaanderen), Hugo Houle (Astana), Damien Touze (Cofidis), Jesper Asselman (Roompot-Charles). Their gap crept out to eight minutes as Deceuninck - Quick-Step and Jumbo-Visma led the gentle chase behind. Just prior to the Oude Kwaremont, the first climb of the day, Niki Terpstra (Direct Energie) was involved in an innocuous looking crash. Unfortunately the Dutchman was completely motionless and his race was done. Before the climb we did see that, although Terpstra was in a bad way he was now at least moving. 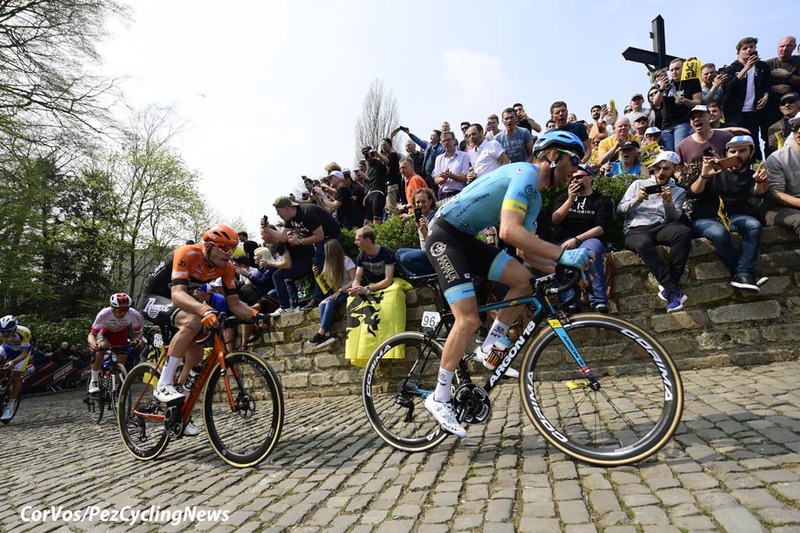 The leading four had found their gap cut towards the four minute mark but the peloton were going in slow motion on the second climb of the day, the Kortekeer. 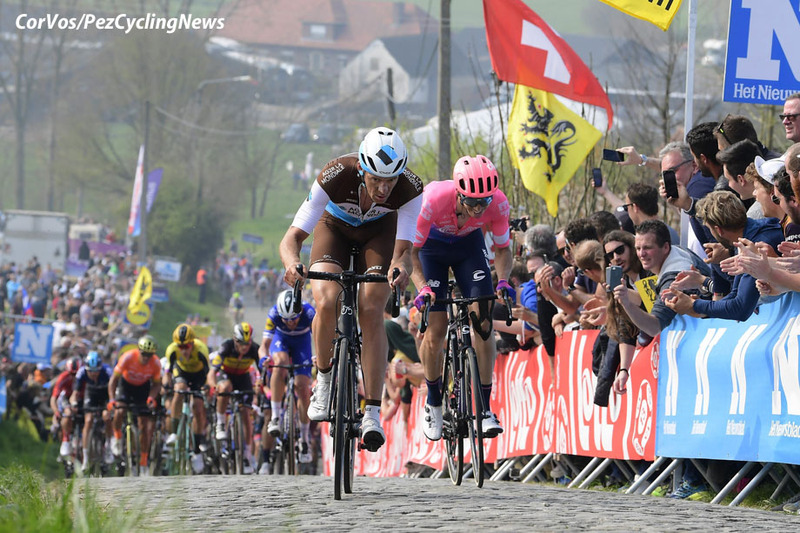 The speed cranked up again but Zdenek Stybar (Deceunick-Quick Step) suffered a rear wheel puncture and the speed was knocked off to little more than a crawl as the leading quartet increased their gap beyond six minutes. We were approaching the final 100km and the speed was ramping up. The leaders had seen their gap drop down to less than three minutes. 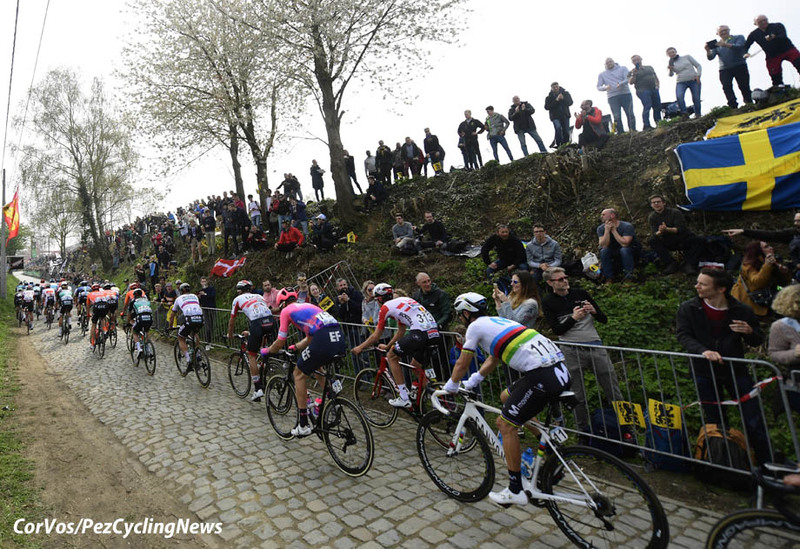 In the peloton there was a sprint as the race approached the Muur Kapelmuur. The great climb might no longer be the defining point of the race but it is still one where a split can be made or a favourite can lose contact. The leaders would be the first to make it onto the climb but their lead was just two minutes, unless the peloton eased off, their time in the lead was going to be limited. There hadn't been a real selection made yet but the peloton had thinned out on the Kapelmuur. The climb might not have split the bunch but like so often happens, the split had been made on the roads immediately afterwards. A large group had gone clear but it didn't contain Sep Vanmarcke (EF Education First), Oliver Naesen (AG2R-La Mondiale), or Philippe Gilbert (Deceunick - Quick-Step). EF had numerous riders in the lead group but none were Vanmarcke. The leading group had enough teams represented that all of the chasing was falling on the shoulders of AG2R-La Mondiale. The gap was creeping out to a minute though. 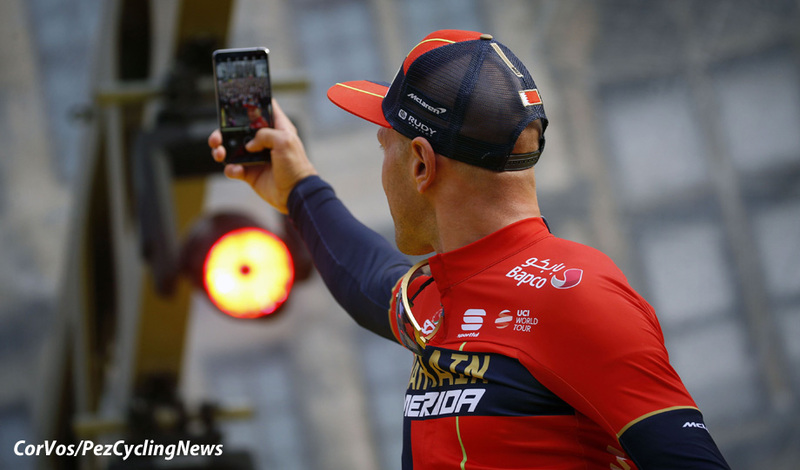 Lotto Soudal were also missing from the lead group and they were joining the chase. It was a very big ask though at this point with 85km to go. 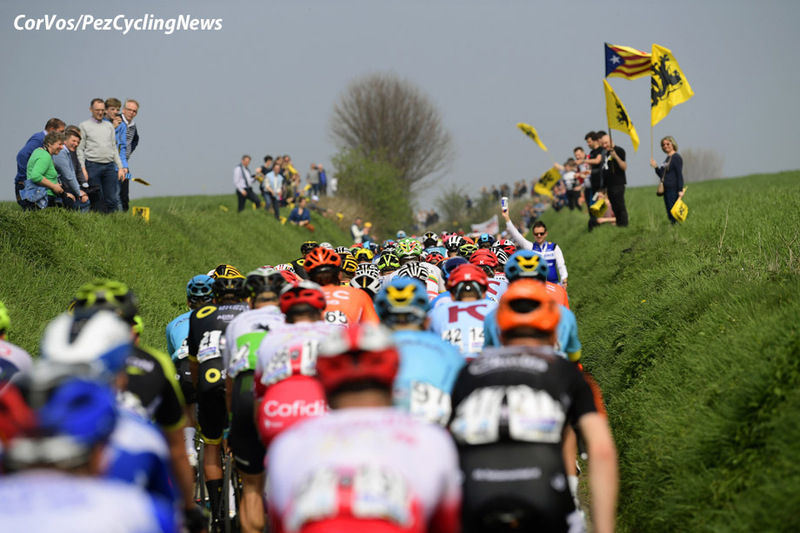 As the action was happening behind the leading group there was also action ahead of them as four riders went clear; Lukas Postlberger (Bora-Hansgrohe), Yves Lampaert (Deceunick - Quick-Step), Nelson Olivera (Movistar), and Matti Breschel (EF Education First). Their gap was only 15 seconds but with both Deceunick and Bora involved in the leading four it was down to other teams to chase. 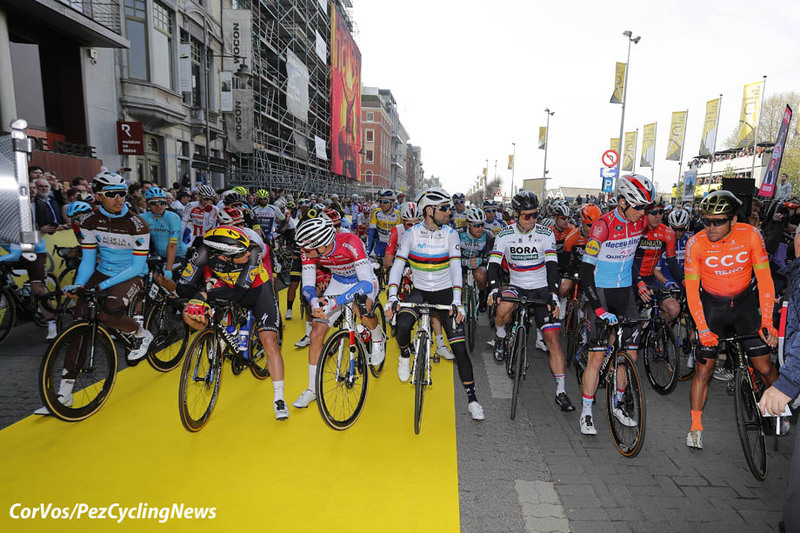 The leaders were brought to heel and it was now a who's who of Flanders favourites. Very few teams had enough riders to control the leading group and the effort was not consistent. That was playing into the hands of the chasers who were now under 50 seconds. Nico Denz (AG2R) was doing almost all the chasing and the gap was now just 20 seconds. This was looking like it was all going to come back together. It now was all back together as they hit the Kanarieberg. The group had swelled to around 70 riders as we headed towards the final eight climbs. There was now just about 5km to go until the second ascent of the Oude Kwaremont and CCC were all over the front of the bunch. The pace had slightly eased off though after the unsustainable attacking that had taken place when the split happened. 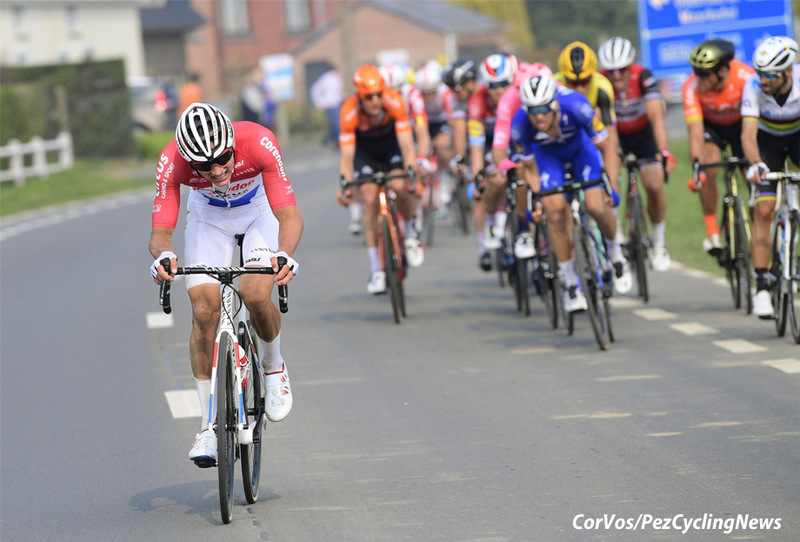 Mathieu Van der Poel (Corendon-Circus) had found himself on the right hand side of the road as they made their way through a town but he then needed to bunny hop over some road furniture and as he landed his front wheel appeared to either buckle or the tyre peeled off. He kept it upright for as long as he could but then flipped over the bars as he came to a stop. The Dutchman was back on his bike though. Movistar were having a great day so far. They had at least five guys in the lead group and Alejandro Valverde had looked composed for the entire day so far. He hadn't needed to put his nose in the wind at all and he was getting as easy a ride as you could get at this point in the race. Up ahead there was a leading trio who had formed on the Oude Kwaremont and the Paterberg; Stijn Vandenbergh (AG2R-La Mondiale), Vanmarcke, and Kasper Asgreen (Deceunick - Quick-Step). They hit the Koppenberg with a 20 second lead. They had kept that lead as they crested the top of the brutal cobbled climb. They were being chased by Dylan Van Baarle (Sky) who was beginning to close in on the leaders. Van Baarle was going to make the junction and we had four leaders once again with 42km to go. Incredibly Van Der Poel was back with the chasers. He'd had a horrible 20km chase but he was now back in the peloton. He also had team mate Stijn Devolder in with him and the small Belgian team were looking strong. Up ahead the same couldn't be said for Vandenbergh who was fading badly and was on his way out of the break. Van Baarle was riding very strongly and he was looking good if he could just keep the break going. In the peloton it looked like they were going to split up over the top of the Taaienberg but nobody had forced the pace and the group were still together and about 40 strong. The attacking was relentless though, groups of three and four were pinging off the front of the peloton then reforming then going again. With 32km to go the peloton were all together and the trio had just 24 seconds of a lead. It had neither increased nor decreased for a number of kilometres and they were in danger of being caught as they headed towards the Kruisberg. Oliver Naesen had a very poorly timed mechanical requiring a bike change and he was chasing as the peloton hit the Kruisberg. In the lead Van Baarle was pushing clear, he was looking incredibly strong. 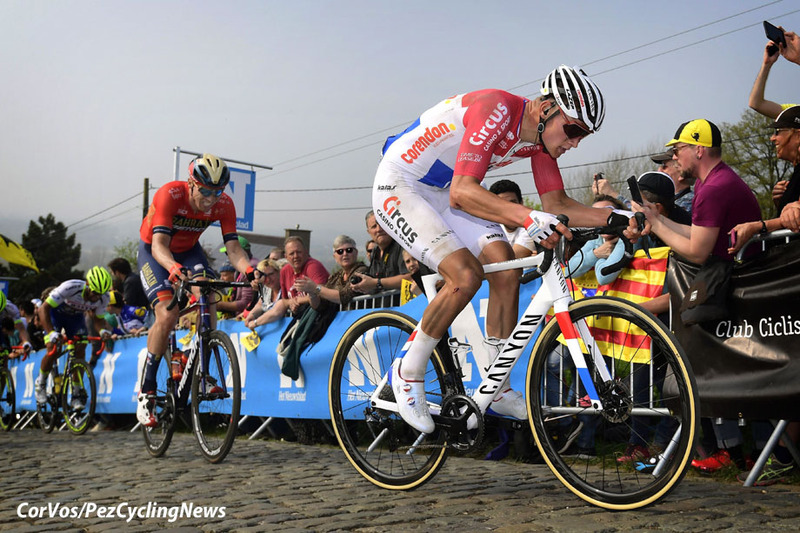 Bob Jungels (Deceunick - Quick-Step) was the next rider from the Belgian team to push on and he was countered by Van Der Poel with Valverde and Greg Van Avermaet (CCC) in the wheels. Vanmarcke had been kicked out of the break and was now falling back into the chasers with team mate Alberto Bettiol putting in a great ride. Van Avermaet and Jungels had joined the two EF Education First riders but they were being shut down by the peloton. There now just 26km and two climbs to go, there were still at least 20 riders who could still win. Naesen had made it back after his mechanical misfortune and he was sat near the front as the race made its way to the penultimate climb. Van Baarle was the first to hit the foot of the Oude Kwaremont. Bettiol was closing fast though and he was forcing riders to put on their pain faces as he streamed by the leaders. Van Avermaet was chasing with all the favourites on his wheel. The Italian went over the top by himself with Naesen now leading the chasers just ten-seconds behind. Would they work together though? The chasers weren't working together, Van Avermaet was on the front but nobody else was helping him out. Bettiol had one more climb to go before the flat finish and his lead was now 22 seconds. 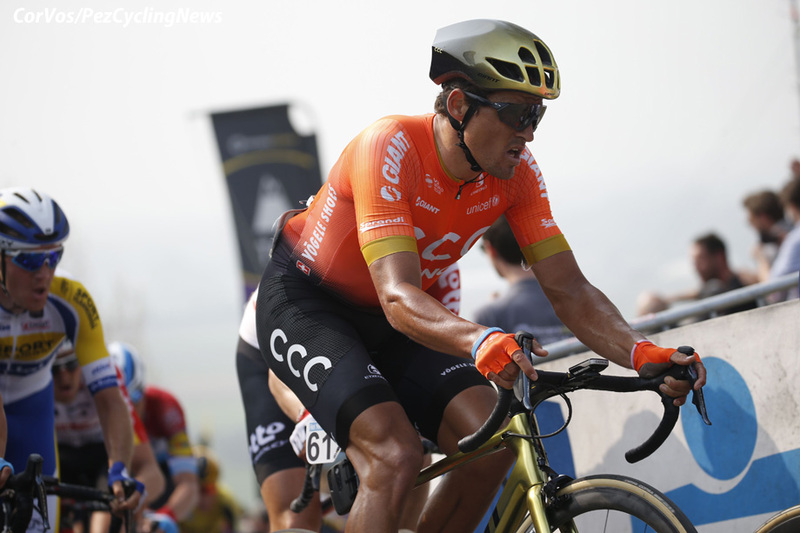 He hit the Paterberg in the lead and Van Avermaet, Naesen, and Wout Van Aert (Jumbo-Visma) were beginning to forge clear. Van Der Poel appeared from nowhere though and he was the second rider to crest the Paterberg. Jungels was gone, Van Baarle was gone. The pool of possible winners was eroding. 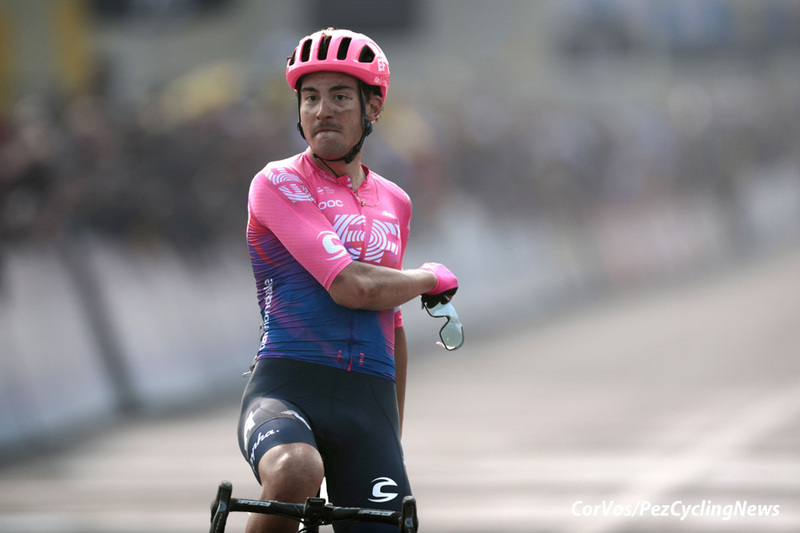 Bettiol had lost none of his advantage and he was sweeping down to the flat finish. Van Der Poel was chasing solo but he was about to be caught by the rest of the peloton. Again, some riders had been tailed off but we still had a group of 15 chasing the lone Italian. His gap was only ten-seconds though, the chasers were working together and Bettiol was coming back into the fold. But no, they stopped working together, Deceunick - Quick-Step were doing all the work and when they stopped the lead pushed out towards 20 seconds. 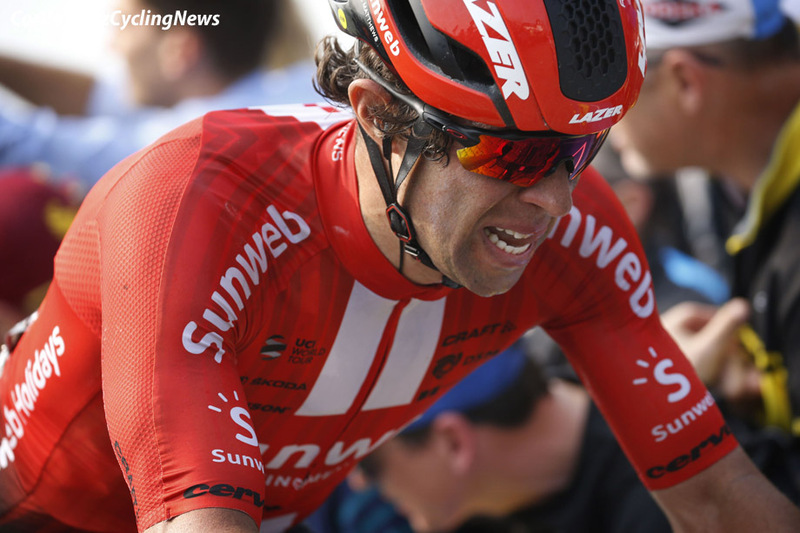 We hadn't mentioned them all day but Alexandr Kristoff (UAE Team Emirates) and Michael Matthews (Sunweb) were two sprinters who had made it through the challenges and were now in the group. Bettiol's gap wasn't decreasing though, the chasers were doing lots of attacking but not lots of pace setting. 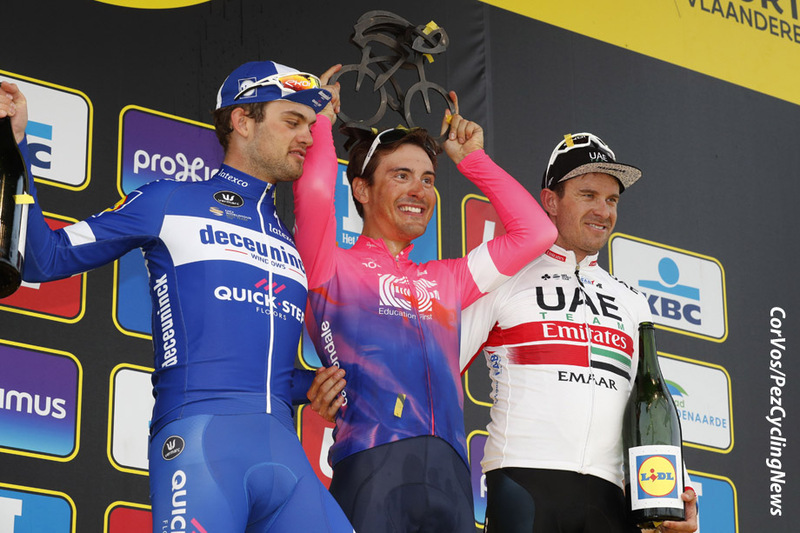 Bettiol's team mate, Sebastien Langeveld, was closing down attacks and when he found himself on the front all the impetus from the chase disappeared. Bettiol was 24 seconds in the lead with 7km to go. The chasers were now working together but the gap wasn't coming down. There was just 6km left to race. 5km now and the gap was beyond 20 seconds but only slightly. This was not game over, one strong attack or late charge would bring him back. The gap was going back out though, a lot of riders had made it to the front but perhaps too many to work well together. 3km to go and Bettiol's lead was 17 seconds. That could be closed but only by a lone attack or a concerted chase. The Italian was surely going to stay clear though, his gap was now on the way back up and it looked like the chasers had thrown in the towel. 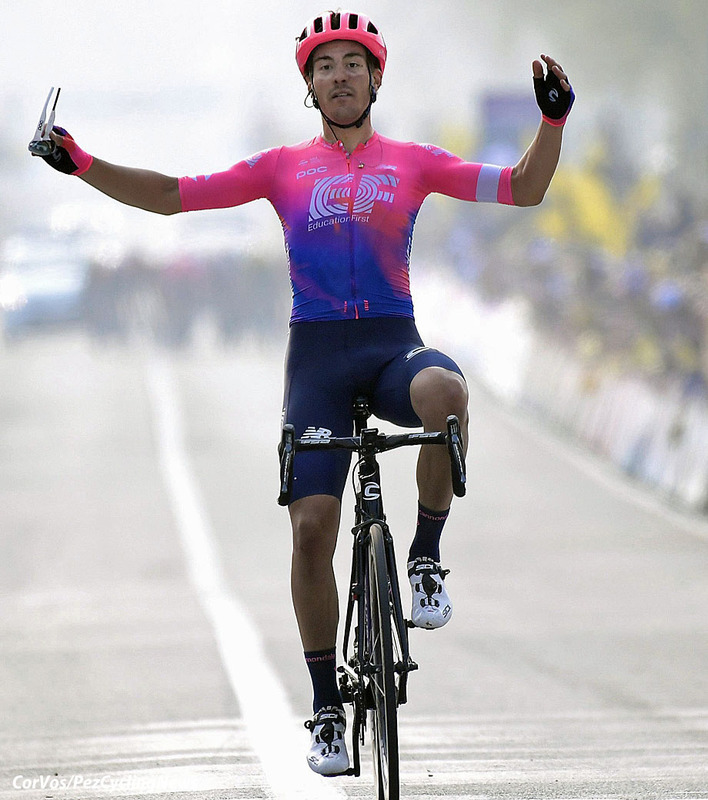 Bettiol was going to take the biggest win of his career to date, surely one of the least fancied Tour of Flanders winners for a number of years? With 1km to go it was almost game over. Bettiol was going to triumph, he was the strongest rider on the day and he had dominated the final two climbs. Kasper Asgreen, who had done so much early on, kicked clear in the finale to take second place with Kristoff winning the sprint for third place. Langeveld did a wonderful job spoiling the attacks from the chasing group and Vanmarcke laid the table for Bettiol's late attack. It was a true team performance. 25. Sep Vanmarcke (Bel) EF Education First at 2:20.